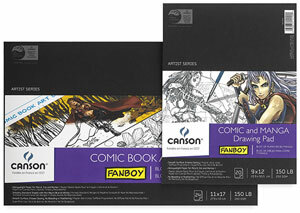 Make the move from comics fan to comics creator with Canson Fanboy papers. The papers are available in industry standard sizes for comic and manga strips, pages, and covers. Extra-white, acid-free paper accepts ink, marker, felt tip, and pencil. The smooth texture is great for scanning. Papers are erasable, with no marker bleed-through and no buckling. Non-repro blue guidelines help you create panels and maintain character proportions. "How to Draw" instructions are included in each package. Heavyweight bristol board and drawing papers are suitable for preparing finished work to save or share with others. Lightweight sketch papers are ideal for beginning the creative process through conceptual sketches of characters and storyboards. Bristol Board, 260 gsm — This very smooth, heavyweight paper is best suited for use with pen and pencil. It also features good erasability. Drawing Paper, 250 gsm — This heavyweight paper works well with a variety of media including ink, marker, and pencil. The weight of this paper helps avoid bleed-through and buckling caused by marker or ink. It also resists damage from erasing and scraping. Sketch Paper, 96 gsm — This multi-use paper can accommodate a variety of dry media including pencil, pastel, and charcoal. It can also be used with pen. The surface erases easily. Sketch Paper, 74 gsm — This multi-use, lighter weight paper can be used with pen, pencil, pastel, and charcoal. The paper also features good erasability. Make the move from comics fan to comics creator with Canson Fanboy papers. The papers are available in industry standard sizes for comic and manga strips, pages, and covers. Extra-white, acid-free paper accepts ink, marker, felt tip, and pencil. The smooth texture is great for scanning. Papers are erasable, with no marker bleed-through and no buckling. Make the move from comics fan to comics creator with Canson Fanboy papers. Available in industry standard sizes for comic and manga strips, pages, and covers. Extra-white, extra-smooth, acid-free paper accepts ink, marker, felt tip, pencil and scans easily. Papers are erasable, with no marker bleed-through. Non-repro blue guidelines help you create panels and maintain character proportions.